About three months back, in January, I was scheduled to interview with the CEO of a large Private bank as part of a competition, and I thought it only to be prudent to learn about the banking Industry. 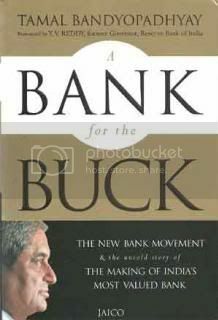 In my google for the same I stumbled across Tamal Bandopadhyay’s book – Bank for the Buck. It captures the two decades that HDFC Bank has been in existence with a meticulous eye for the detail. Without batting an eyelid further I picked up the book and hopes to complete it in one week. The interview was scheduled in a week from then. Well, other things caught up, I could not go any further that 50 pages in that one week and well, the interview also did not go the way I wanted it to. I did end up completing the book in a couple of night’s read from then, and, like any other biography, this one too was compelling as it is a piece of real history unfolding in front of you. The book is as much a story of HDFC bank as it is about the first set of new banks that entered the market in the 90’s. it is also very much about Aditya Puri, the long standing head of the bank who was handpicked for the job by Deepak Parekh, the chief promoter of the bank. The best part about the book is the ease in which one chapter flows into another. The opening of the book, “On a Thursday morning in February 1994, the telephone rang at Citibank… “ sets the pace for the remaining part for the book. It sets the context that this would not be a book laden with facts but is more like a story book charting the growth of HDFC bank from its inception. The first part of the book states how the top team, also called the dirty dozen was brought together and how the initial setup was done for the bank. The later part charts the growth trajectory the bank takes and the consistent returns it has managed to provide in different volatile conditions. One thing where the book could have brought in some light is the external world and its impact in helping the bank grow from brick to brick. Also, it does not really dwell too much into what really helped HDFC bank become successful that other banks could not replicate. Overall, I would recommend this book to everyone having even a faint interest in banking, entrepreneurship or even a taste for a good story.